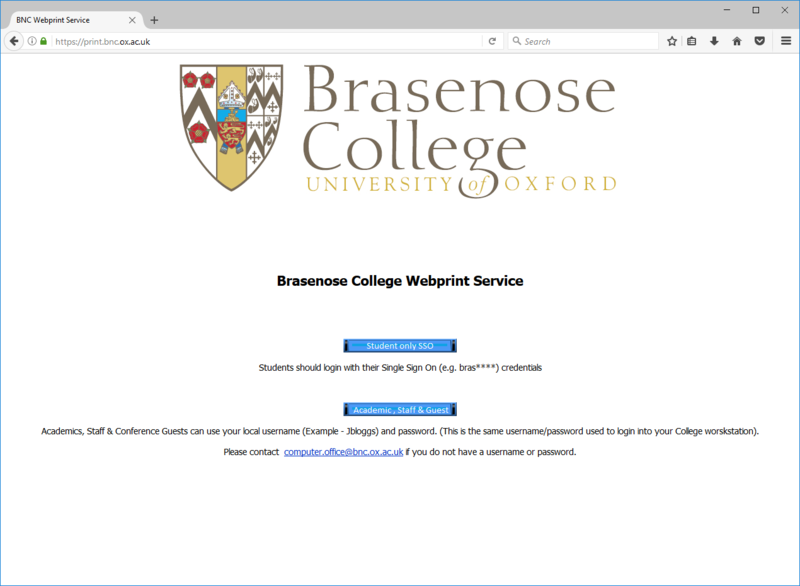 Brasenose College provides a service for printing called WebPrint. 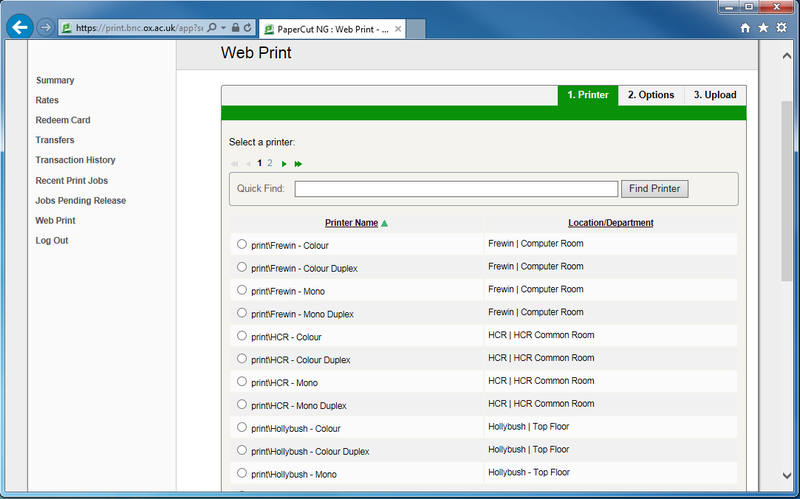 You can send documents to the college printers from any computer (including your own personal machine) via a website. To send a document to the printer, you will need to be connected to the internet by either the college wired network, Eduroam wireless network or BNCWiFi. To use over a mobile data connection you must have your University VPN Client active. Start by going to "https://print.bnc.ox.ac.uk". You will see this screen. If you are a student, click 'Student Only SSO' & enter your standard SSO Login details (click to find out more about SSO login types). You can bookmark the page after you login to avoid this screen every time! 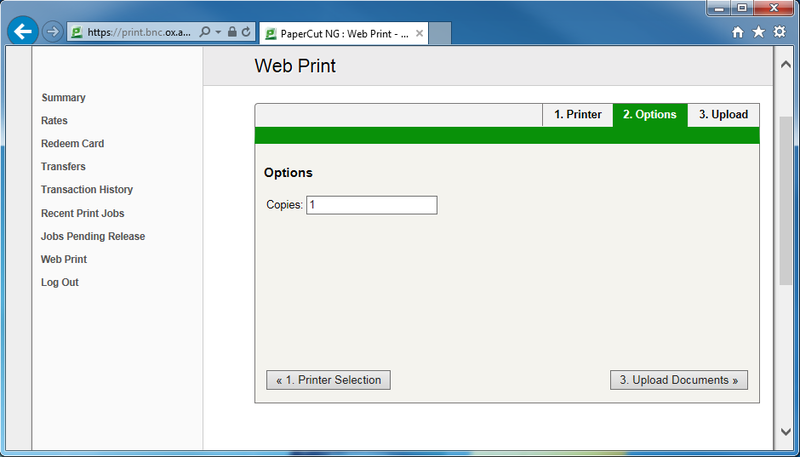 To print a document, select "Web Print" on the left hand side and then click “Submit a Job”. Choose where you would like to print the document. There are Printers in the JCR and HCR, the Library and Stallybrass Library, the Porters Lodge, Frewin Computer Room and St Cross Computer Room. If you would like to print Duplex (double sided) or Monochrome (Black and White), you will see there is an option for that. Click at the bottom to continue. Now choose the number of copies that you would like to print. Finally, upload the files you would like to print. You can do this by dragging a file and dropping it into the box, or you can click “Upload from this computer” and browsing for the file you want to print. The different file types able to be printed are listed below. Clicking “Upload & Complete” will submit your document to the printer. There are public printers for all students in the Lodge, Common Rooms , Main Library, Stallybrass Law Library, Frewin Hall computer room (in Frewin Hall).